B-roll and video highlights of ground-breaking ceremony and event. 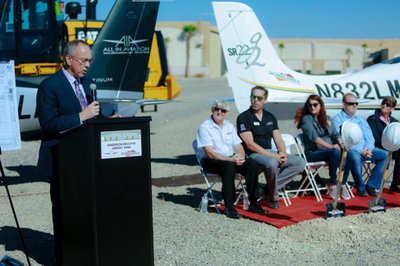 Kenny Scherado, president of Lone Mountain Aviation, addresses guests to the ground-breaking event on Friday, October 12 at Henderson Executive Airport. 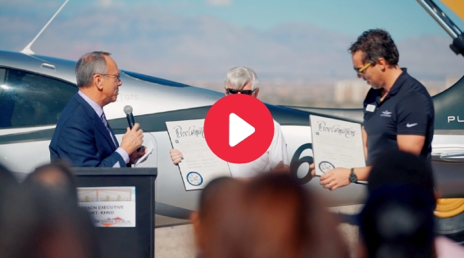 Paul Sallach, president of All In Aviation, and Kenny Scherado, president of Lone Mountain Aviation, spoke about the future of the facility and what it will bring to the Southern Nevada community. Clark County Commissioner Jim Gibson, City of Henderson Mayor Debra March, and representatives from the offices of Senators Dean Heller and Catherine Cortez-Masto, as well as Congresswoman Jacky Rosen were also in attendance and presented proclamations and congratulatory letters to commemorate the facility’s ground-breaking. 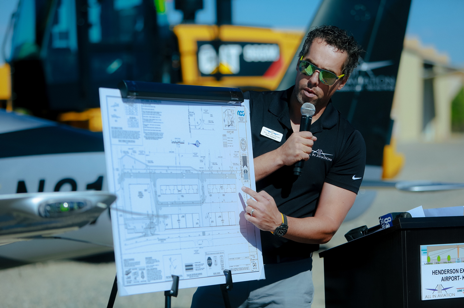 Paul Sallach, president of All In Aviation, explains plans for the future 25-hangar complex at the ground-breaking event on Friday, October 12 at Henderson Executive Airport. County Commissioner Jim Gibson speaks at the ground-breaking event for the HND Hangars aviation complex on Friday, October 12 at Henderson Executive Airport. Partners and dignitaries posed with hard hats and shovels at the site of a future 25-hangar complex on Friday, October 12 at Henderson Executive Airport. L to R: Kenny Scherado, president of Lone Mountain Aviation; Paul Sallach, president of All In Aviation; Jim Gibson, Clark County Commissioner; Debra March, Mayor of Henderson; Nathan Schweigart, General Contractor, NDL Group; and Rosemary Vassiliadis, Director of Aviation for Clark County. The only Cirrus Aircraft training partner in Southern Nevada, All In Aviation is a full-service aviation company offering flight training, pilot certifications, and aircraft rental, sales, management & storage. Dedicated to growing and developing more pilots, All In Aviation is a trusted partner for aviation training, from a student’s very first flight through some of the most advanced pilot certifications. With an emphasis on quality customer care, All In Aviation’s flight instruction is led by highly experienced and professional certified flight instructors. Open to anyone, private pilot training is conducted in the air and in a classroom setting, with most students certified after completing 60-70 hours of instructed flying. Established in 1982, Lone Mountain Aviation is the largest general aviation FAA Part 145 Certified Repair Station in Nevada, servicing top aircraft manufacturers including Cirrus, Cessna, Piper, Beechcraft, Mooney, TBM, Pilatus, and Pratt & Whitney. Lone Mountain is dedicated to providing the highest quality aircraft maintenance and repair available to the general aviation community. With technicians uniquely suited to maintaining, repairing and modifying the most technically advanced aircraft flown today, Lone Mountain’s approach to customer service is to keep pilots flying by maintaining budget, reducing down time, and delivering a safe, reliable and quality product. Visit http://lonemountainaviation.com/ for more information, and follow on Facebook at @LoneMountainAviation.